The majority of our current work is aimed at understanding the underlying physiological processes in phytoplankton and corals that are altered by rising CO2 concentrations. The systems of most interest to us are the inorganic carbon uptake and processing systems in these organsims that control delivery of inorganic carbon (carbon dioxide, bicarbonate, and carbonate) for photosynthesis and calcification. Phytoplankton are unicellular algae that perform most of the photosynthesis in the ocean. Like plants on land, the rates of photosynthesis and growth in many phytoplankton increase at higher CO2 concentrations. Phytoplankton use a system called the CO2 concentrating mechanism to increase the concentration of CO2 around the CO2 fixing enzyme RubisCO, and it is thought the behavior of this CO2 concentrating mechanism is an important part of the response of phytoplantkon to increased CO2 concentrations. To beter of understand the response of phytoplankton to rising CO2, we have been studying the physiology and genetics of CO2 concentrating mechanisms in selected groups of phytoplankton. Phytoplankton elevate the concentration of CO2 around the carbon-fixing enzyme RubisCO to ensure it functions at maximal efficiency. The system used to do this is known generically as the CO2 concentrating mechanism (CCM), but its molecular components vary dramatically among phytoplankton taxa. We are investigating the physiology and molecular biology of the CCM in several marine phytoplankton species (mainly diatoms). We have developed new approaches to measure carbon transport rates in phytoplankton and have begun genetically manipulating components of the CCM in diatoms. ​Concentrating CO2 is difficult because biological membranes are highly permeable to neutral compounds such as CO2. Phytoplankton must spend a significant amount of energy on the CCM. When extracellular CO2 concentrations are increased the CCM does not have to work as hard and can be down-regulated. It is believed that energy saved from down-regulation of the CCM is put towards photosynthesis and growth, explaining the response of phytoplankton to rising CO2. We are attempting to construct energy budgets for the CCM to determine if this hypothesis is plausible. This work has been conducted in collaboration with: Francois Morel (Princeton University), Chris Dupont (J. Craig Venter Institute), Yusuke Matsuda (Kwansei Gakuin University, Japan). Figure 1. Carbon fluxes in a marine diatom determined in our lab using membrane inlet mass spectrometry and reaction-diffusion modeling (Hopkinson et al. PNAS 2011). Corals are the foundation species of coral reef ecosystems, which with the diversity and proliferation of life are of great interest to people. At high CO2 concentrations many corals build their calcium carbonate skeletons at slower rates, and consequently may grow slower in the future. Corals precipitate their calcium carbonate skeletons in the 'calcifying fluid', which is created below the animal, just above existing skeleton. The chemistry of this fluid is carefully controled to promote the preciptation of calcium carbonate. Most notably calcium and inorganic carbon are delivered to the fluid and the pH of the fluid is raised (made basic) so that all the inorganic carbon is converted to carbonate. At high CO2, the calcifying fluid becomes more acidic, which likely causes the decreased calcification rate. We are investigating what causes the calcifying fluid to become more acidic, and how inorganic carbon delivery to the calcifying fluid may change at high CO2. ​We have developed ways to study inorganic carbon processing in corals using membrane inlet mass spectrometry to measure CO2 reaction and exchange rates and microelectrodes to measure the concentrations of chemicals (pH, carbonate, calcium) in corals. Through this work we have shown that corals have high activities of an enzyme called carbonic anhydrase that helps them deliver CO2 to their symbiotic algae and to the calcifying fluid (Figure 2). This work has been conducted in collaboration with Bill Fitt (University of Georgia), Christof Melie (University of Georgia), Wei-jun Cai (University of Delaware). Figure 2. Likely roles of the enzyme carbonic anhydrase (CA) in inorganic carbon delivery in corals (Hopkinson et al. J Experimental Biology, 2015). ​ We have also shown that high CO2 concentrations in the lower tissue layers of corals drives large influxes of CO2 into the calcifying fluid (Figure 3). While this may serve as an energetically cheap mechanism to supply carbon for new skeletal growth under normal conditions, the CO2 fluxes may increase at high CO2, leading to acidification of the calcifying fluid much like the increased concentration of CO2 in seawater leads to ocean acidification. Figure 3. A) Diagram of a coral polyp highlighting the current conceptual model for calcification and inorganic carbon delivery in corals. B) Composite results derived from microelectrode profiles through coral tissue and into the calcifying fluid. Note the high CO2 concetration in the lower reach of the coral tissue overlying the calcifying fluid (which is below the dotted line). From Cai et al. Nature Communications 2016. Coral reefs are known to be highly productive ecosystems but the exact rates of productivity and the organisms responsible for this productivity have not been studied extensively. We are working on new approaches to measuring the productivity of coral reefs by scaling up the production rates of individual organisms to reef scale using 3D reconstructions of coral reefs. Photosynthetic organisms on coral reefs include a range of algae and organisms that form symbiotic association with a group of dinoflagellate algae (Symbiodinium) including corals and gorogonians. We collect these photosynthetic organisms and measure their photosynthetic rates (oxygen production) individually in chambers as shown in the image to the left. To scale up the measurements of individual primary producers to reef scale, we estimate the abundances of each photosynthetic group (corals, gorgonians, algae, etc) from 3D reef reconscructions. 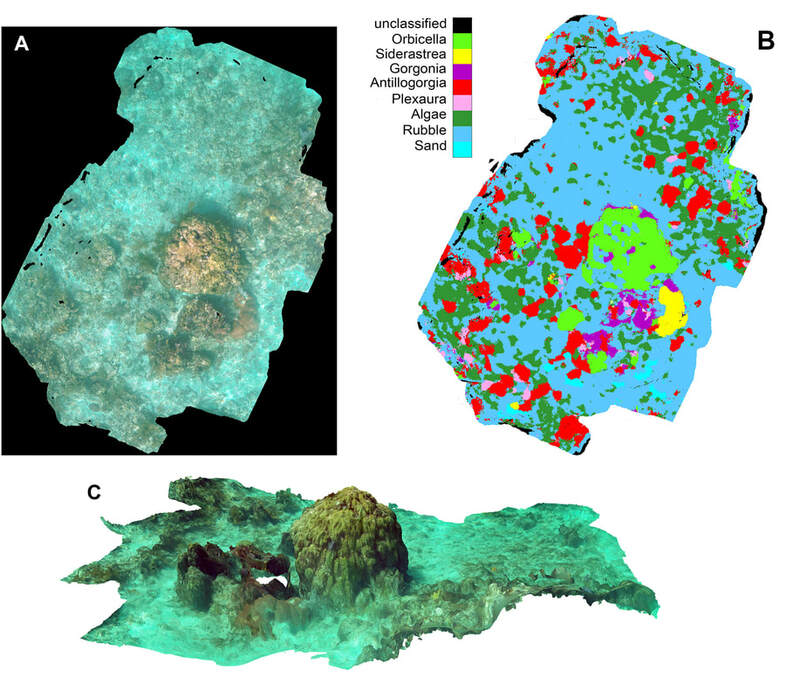 The 3D reef reconstructions are generated from a large number of photographs on the reef using computer vision approaches, and then surfaces are labeled (coral, algae, sand, rubble, etc) with machine learning procedures (Figure 4). ​Figure 4. Sample results of 3D reconstruction and classification of the benthos on Little Grecian Reef in the Florida Keys. A) Overhead view of a 3D reconstruction of a small section of reef (~10m x 5m) centered on a large Orbicella faveolata colony on the reef crest. B) Results of a preliminary automated classification of benthic surfaces (based on Beijbom et al. 2012). C) Side view of the same section of reef to emphasize the 3D nature of the reconstruction.